Published 2006 by Harvard University Press, Cambridge, Mass. I have done my best to transcribe this information accurately. If you would like to locate this book, I suggest you work with your local library. The library can usually locate the book and get it for you through an inter-library loan. I have found my local librarian to be very helpful. 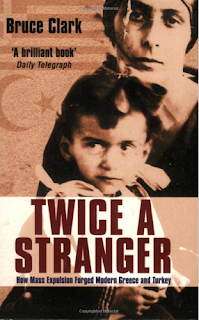 “It was a massive, yet little-known landmark in modern history: in 1923, after a long war over the future of the Ottoman world, nearly two million citizens of Turkey or Greece were moved across the Aegean, expelled from their homes because they were the ‘wrong’ religion. Orthodox Christians were deported from Turkey to Greece, Muslims from Greece to Turkey. This had some bizarre results: Greek-speaking Muslims from Crete were shipped to Turkey, while Turkish-speaking Christians were deported to Greece. At the time, world statesmen hailed the transfer as a solution to the problem of minorities who could not co-exist. Both governments saw the exchange as a chance to create societies where a single culture prevailed. And since 1923, the exchange has been invoked by advocates of ethnic separation, from the Balkans to South Asia.